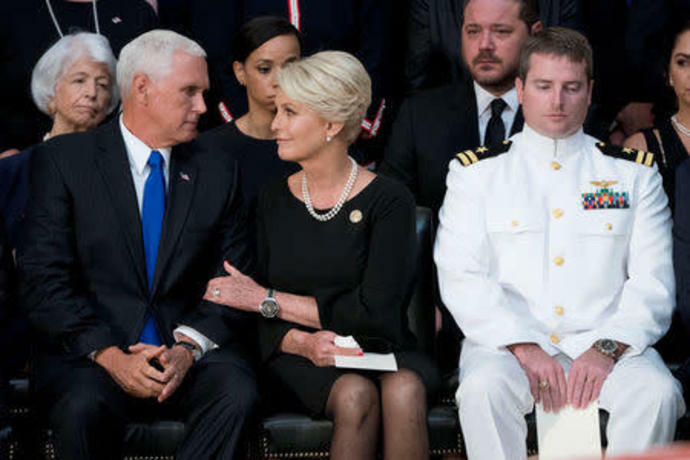 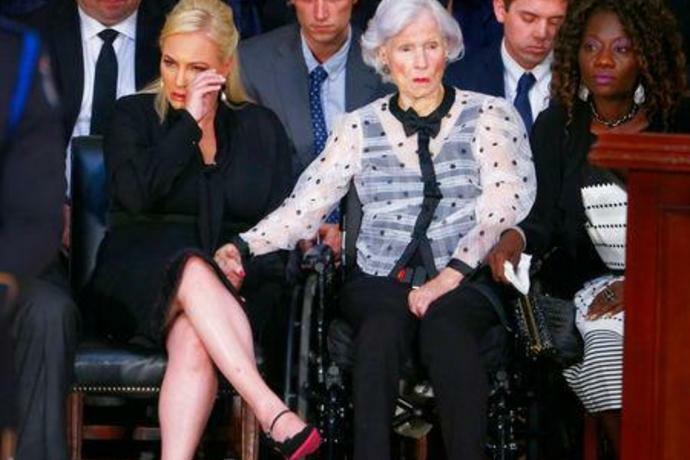 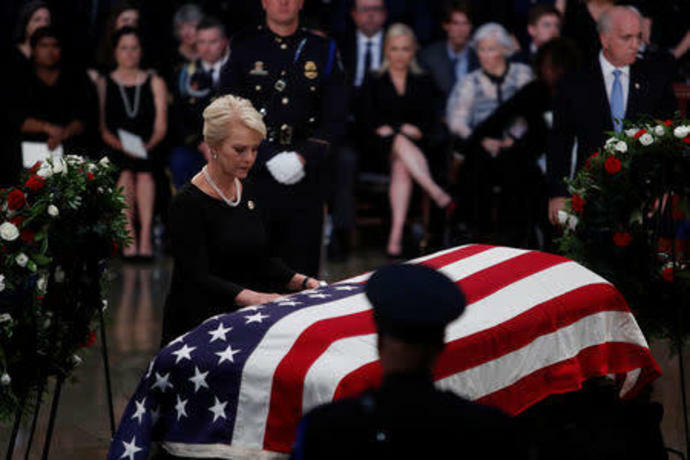 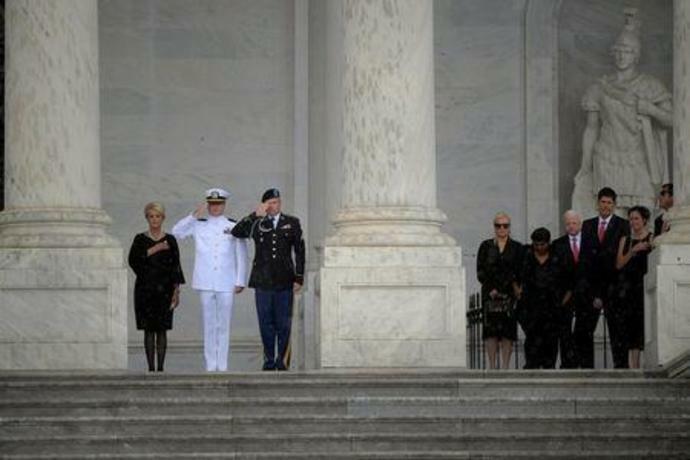 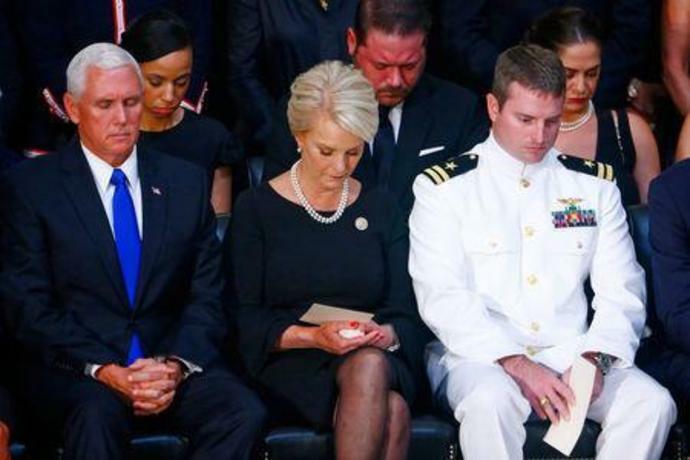 Cindy McCain, wife of late U. 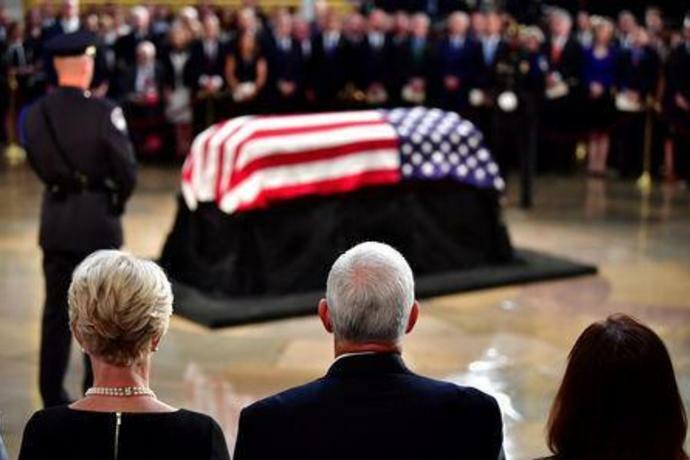 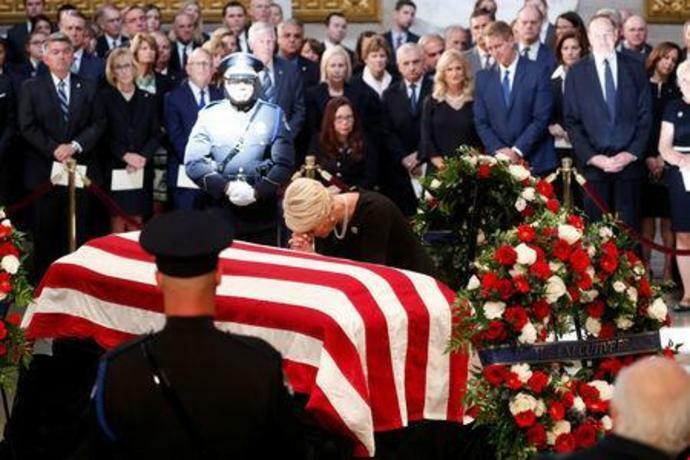 Vice President of the United Staes Mike Pence and his wife Karen Pence view the casket of U.
Mourners look at the casket containing the body of late U.
Meghan McCain, daughter of late U. 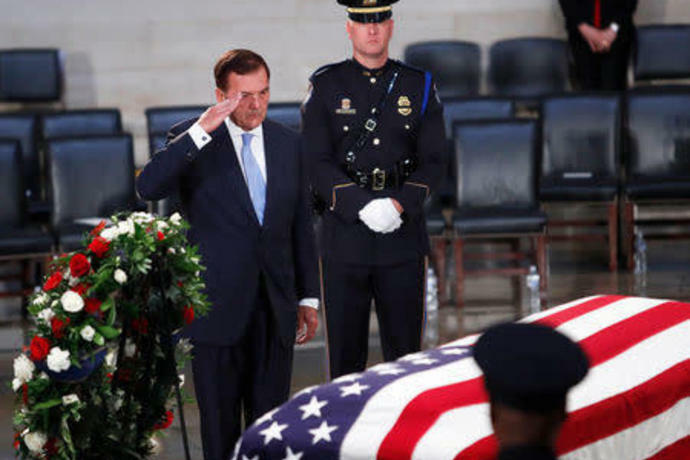 Governor Tom Ridge salutes the casket of the late U. 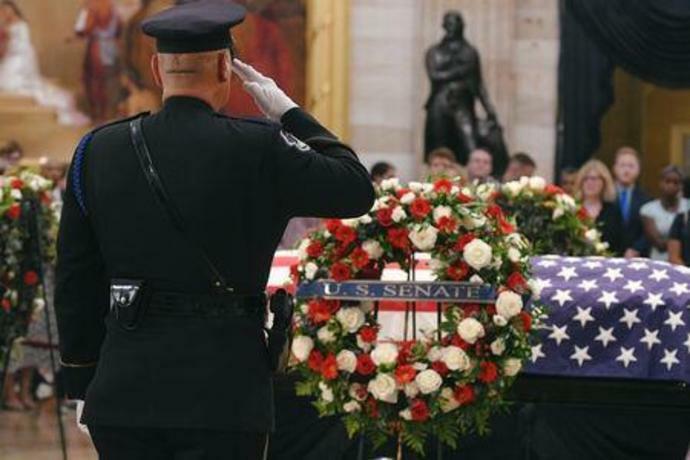 An Honor Guard places the casket containing the body of late U. 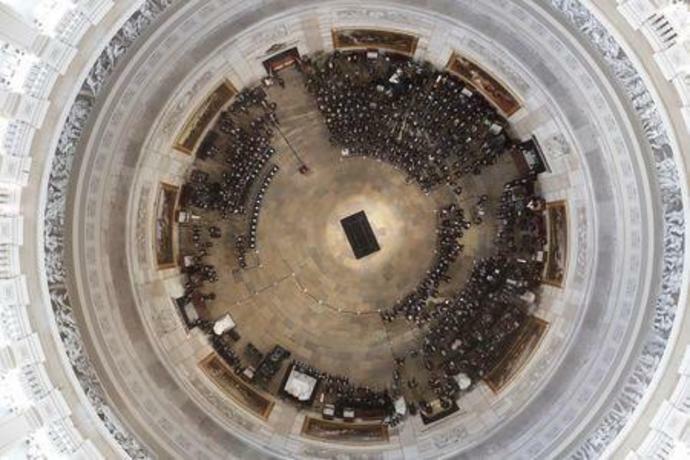 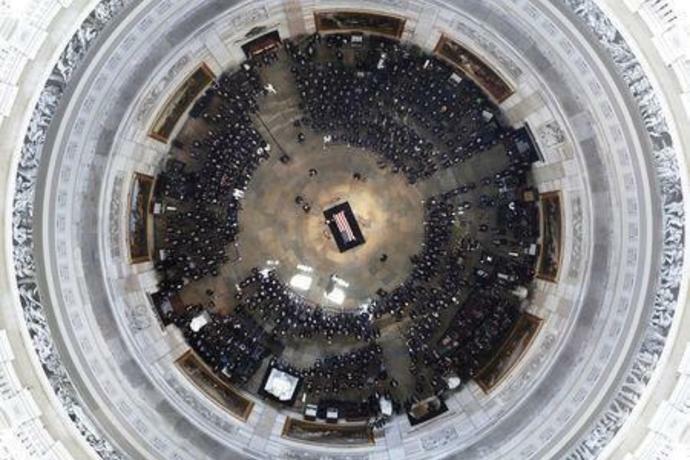 People await the arrival of the casket of U.
Senate Majority Leader Mitch McConnell, accompanied by an aide, walks through the Rotunda before the casket of U. 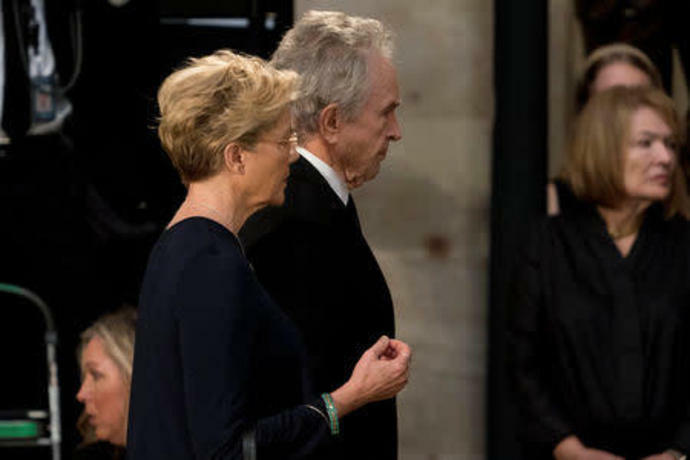 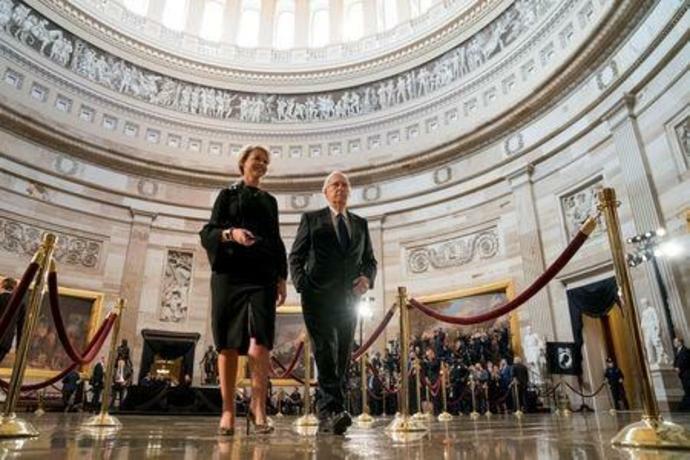 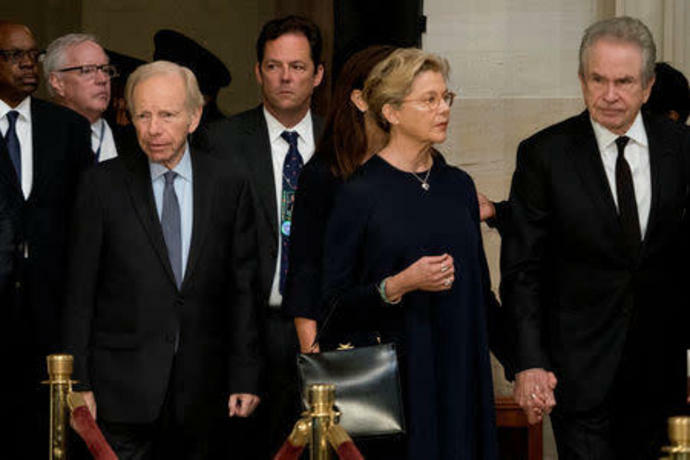 Actors Warren Beatty, center, and his wife Annette Bening, left, arrive in the Rotunda before the casket of U.
Senate Majority Leader Mitch McConnell walks through the Rotunda before the casket of U. 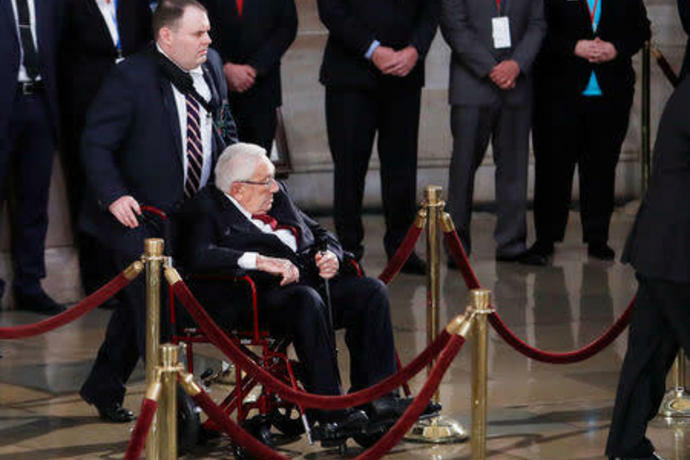 Former Secretary of State Henry Kissinger is shown to his place in the U. 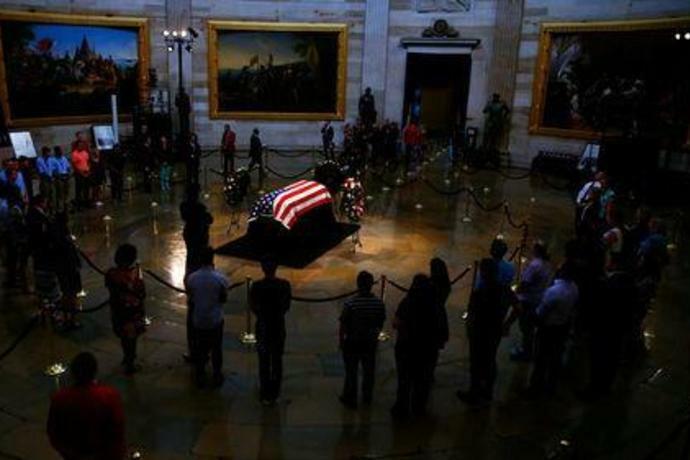 A casket with the body of late U.
Cindy McCain, wife of the late U.
Capitol Police Honor Guard salutes the casket of Senator McCain who lies in state in the Rotunda at the U.
Mourners file past the casket of Senator McCain who lies in state in the Rotunda at the U.
WASHINGTON (Reuters) - Washington's bitterly divided leaders came together on Friday to praise the late Senator John McCain as an embodiment of America's fighting spirit, idealism and sense of humor, but there was one notable absentee: President Donald Trump. 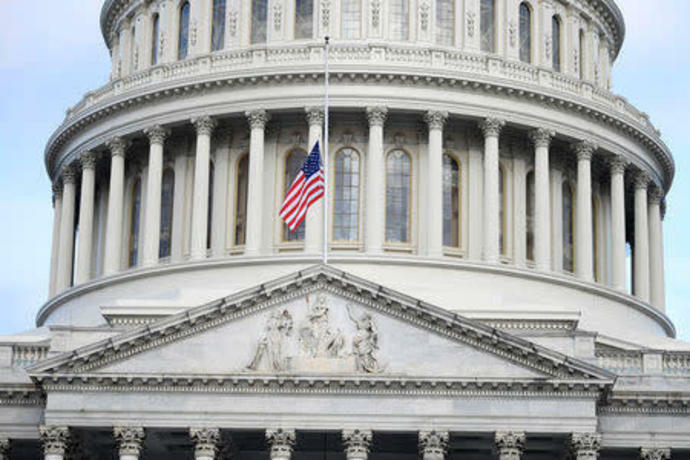 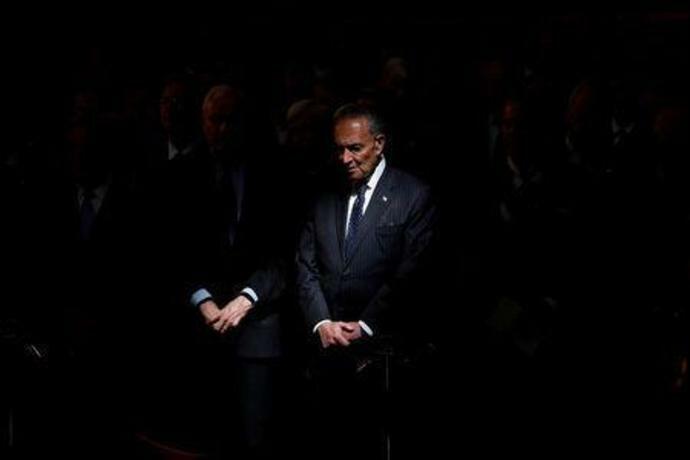 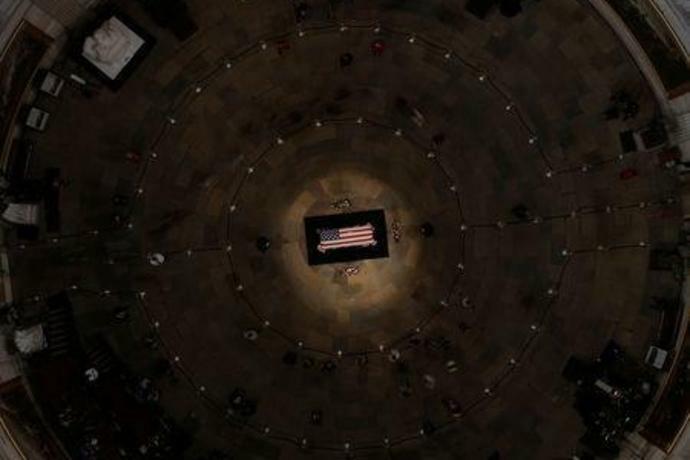 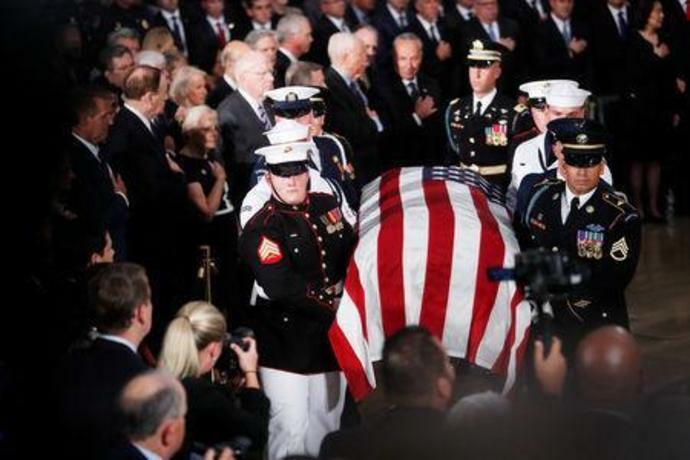 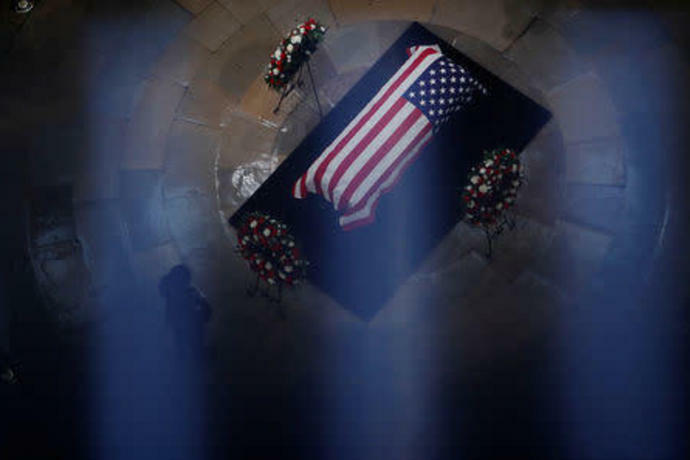 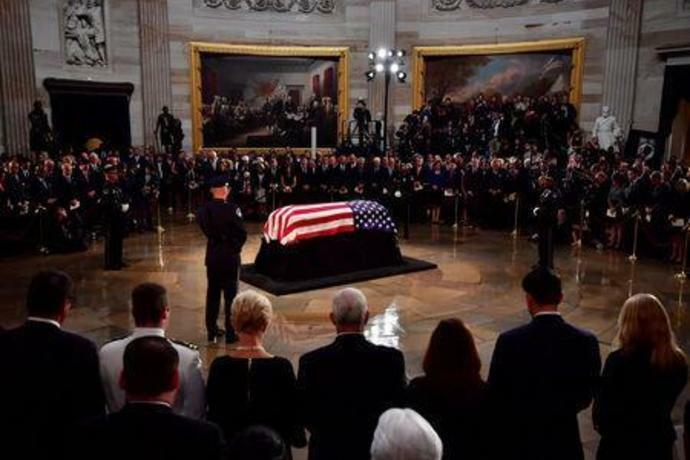 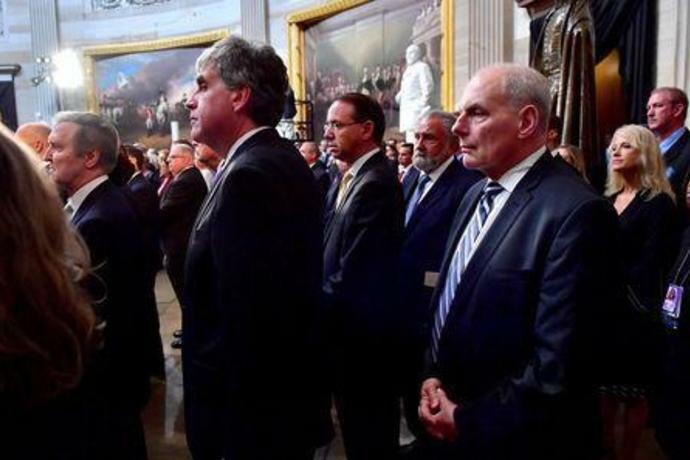 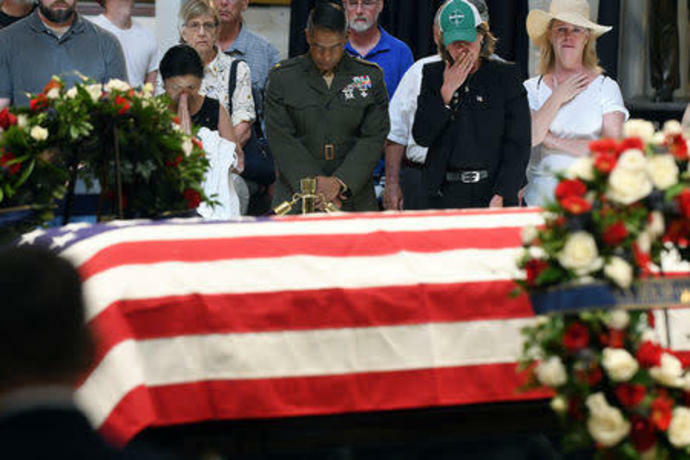 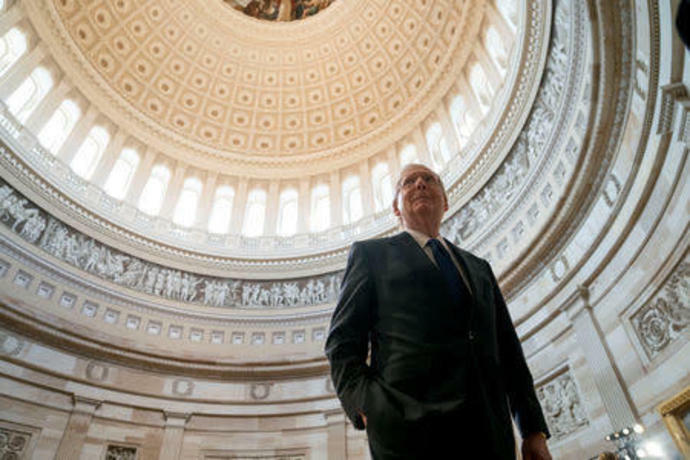 "He had America's fighting spirit, our noble idealism, our solemn patriotism, and our slightly irreverent streak -- all rolled into one," McConnell said. 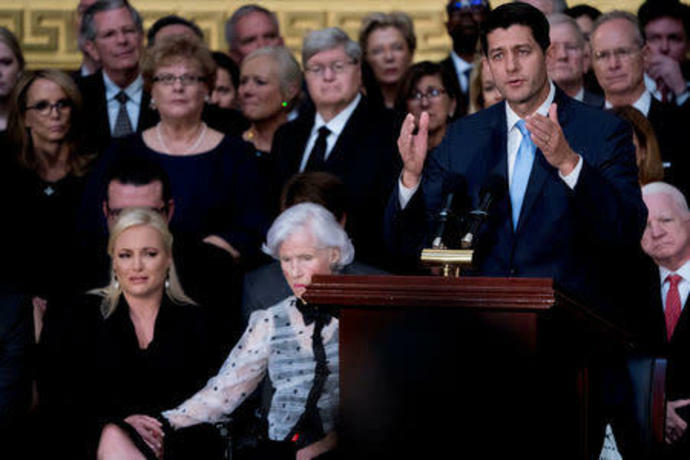 House Speaker Paul Ryan said he was sometimes on the receiving end of McCain's "distinct brand of candor" and said the late senator relished a good fight. 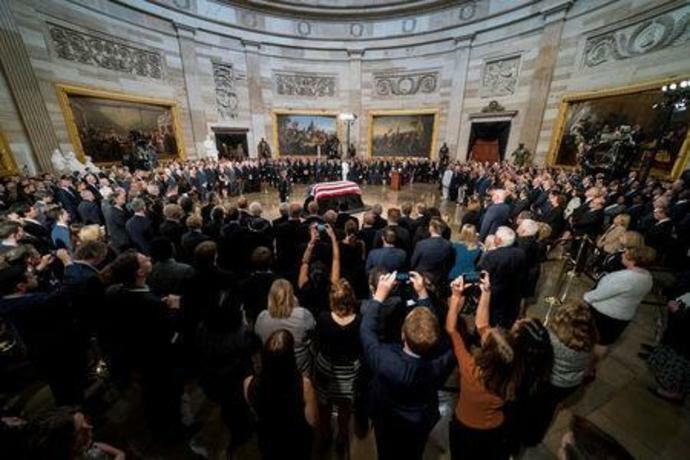 "This is kind of like the death of an era. 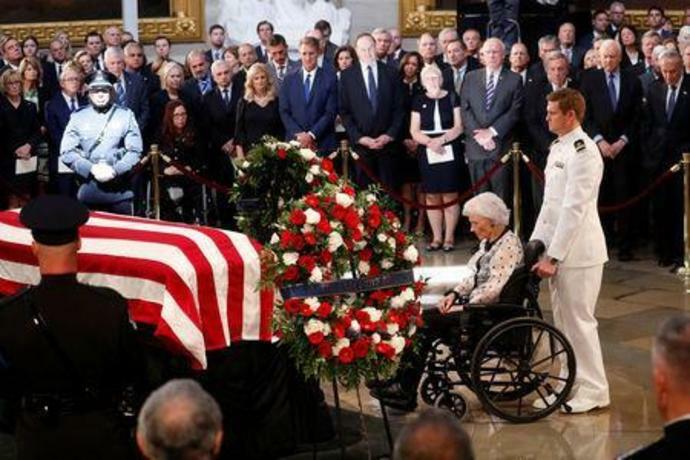 A man who stood up for what he believed, and I can't say I agreed with every position he took, but he did it with dignity," said retired schoolteacher Sue Ellen Raby, 71, who traveled more than 77 miles (124 km) from her Maryland home to pay her respects. 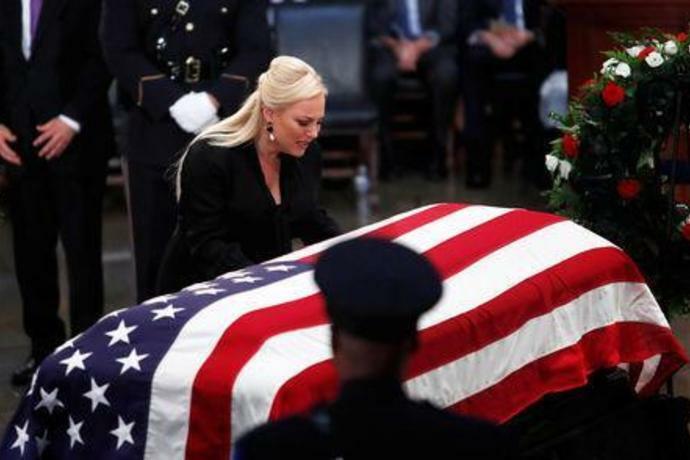 The New York businessman hit back, saying of McCain's 5-1/2 years as a prisoner of war in Vietnam: "He was a war hero because he was captured. 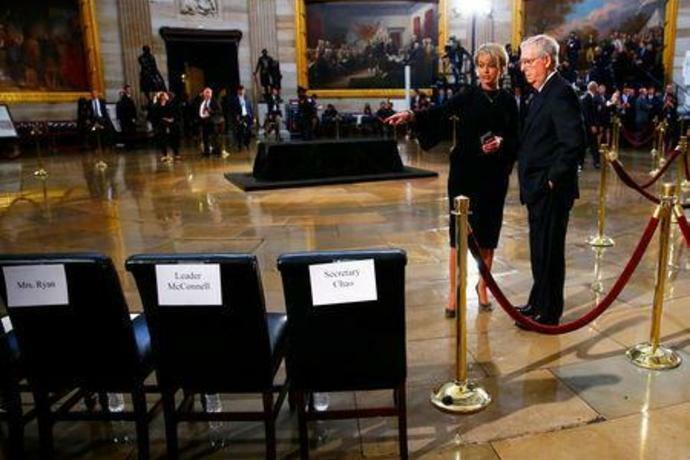 I like people who weren't captured." 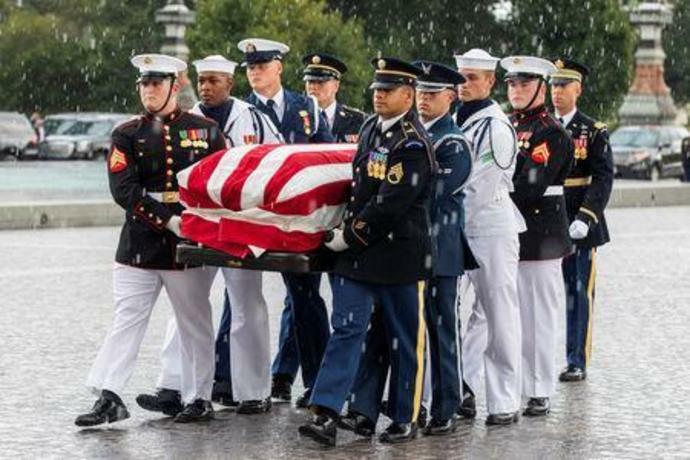 Trump received five deferments that got him out of military service.